A four day trip with John Montana fly fishing for carp on the Columbia River is difficult to describe. The entire trip feels as though you are doing the backstroke in a sea of obsession. You eat, sleep, drink, talk and dream about carp as the rest of the world drops away below the vast blue horizon along with all your cares and worries. The experience becomes all-absorbing. As you would expect I found it exhilarating and profoundly satisfying. In real life wallowing in our obsessions is rarely healthy or practical. After all, life demands attention for the non-trivial. In contrast the difficulty of the Columbia River in the summer defies expectation. Most of us read John’s blog religiously. His frequent pictures of massive carp and reports of staggering numbers gives a false impression. It seems as though his fishery is easier than yours. After all it is hard to swallow or even imagine that John may just be orders of magnitude better than the rest of us. True, with some hard work and a little time on the water most hard-core carpers could reasonably expect to catch more and bigger carp than they are used to. It does, however, take a frightening level of mastery and determination to achieve John Montana levels of success. High water levels precluded fishing John’s most productive water for the entire trip so we started out Friday fishing John's "Option D" water. Option D seemed pretty good to me. We had good light, moderate winds, hungry feeding fish with superb takes and I was on my game. It was exactly what my over-active imagination had been picturing for weeks. The highlight of the day for me was getting to stop, sit back and watch John battle a 22 pounder. What a fish, what a fight. John sticking it to a 22lber! The excellent conditions did not last long however, and on Saturday I awoke to thunder! The rain faded rapidly but we had overcast conditions nearly all day that made sight fishing nearly impossible. I was still on my game however and although I found it harder to spot fish than John we came away from the day with a fair tally, some great takes and the sure knowledge that we had made the best of it. On Sunday conditions went from tough to ridiculous as 25 to 30 mph winds pounded us and the Columbia River all day. The gale force winds virtually eliminated easier shots to smaller fish. In a bizarre and tortuous twist those same winds also brought the big fish shallow and created many awe inspiring but heart rending shots of P.H.D. difficulty to truly gigantic fish. Time after time John gave me the shots. Time after time I failed to connect. With a half hour of good light and 20 feet of prime flat remaining I was extremely dis-heartened when a large dark shape that could have been a weed but was actually an 18lb carp calmly shifted 6" to the right to inhale my perfectly presented Trouser Worm. After all the repeated failures of the day all it took was one great take to save my day! Friday was prime again and we went back to the "Option D" waters looking for something a little easier. Unfortunately I was bone tired and my confidence was shot. You have to set the hook with authority at the slightest indication of a take on the Columbia and that requires a significant amount of faith. Faith was not with me and for much of the day I was setting a fraction of a second too late. Although I touched several fish and lost a few others all I came away with was the smallest carp in the history of Columbia Carpin. Seriously. One and a half pounds (scaled) of carp fury was not exactly what I had in mind for this trip. I had to do the super-duper extended grip just to save a little pride. Yeah baby! One and a half pounds of carp fury! 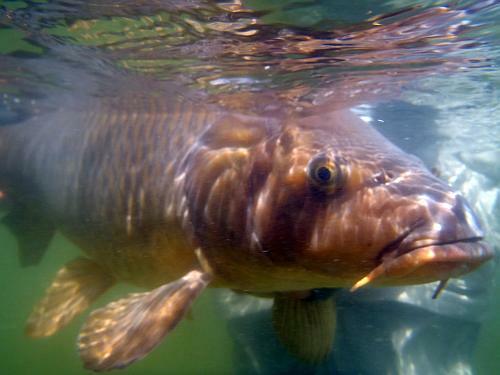 There is nothing easy about how John catches so many big carp on flies in the Columbia River. 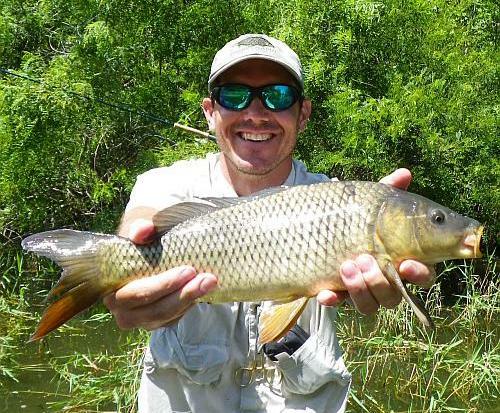 While Columbia carp are large, numerous and typically more willing to eat an extremely well presented fly than I am used to, the intangible challenges are significant. The unpredictability of the conditions and the scope and in-accessibility of the fishery are overwhelming and exhausting. The extremely precise and controlled presentations the carp prefer are demanding and unforgiving. The takes are so subtle as to seem imaginary. Detecting them and timing them at range seems to be as much art as skill. It all combines to make this the most challenging,, intriguing and rewarding fishery I have ever experienced. 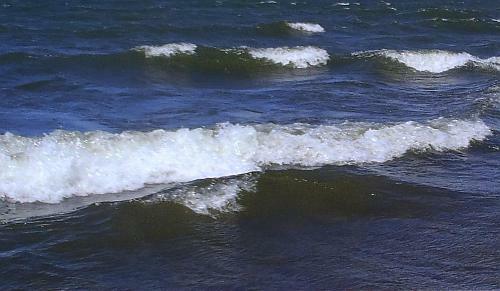 I would have used a FRB with no excuses and I bet it would have worked with the turbid water even in the wind. But, I will only know if I go there! Someday! Nice fish! Great synopsis of the fishery. Gregg - I was possibly going to get into it on another post but you will be happy to know (and both John and I are crying inside a little, which is ridiculous and stupid I know) that a smaller lighter version of the egg was productive sight-fishing to laid up carp several times on this trip. Good stuff Trevor. Giving me a lot more credit than I deserve, but I agree that these fish are not easy! Combine that with tough conditions and we could have easily gotten stoned...instead, we put some nice fish in the net. Good work, great to see you, and we will do it again. We will definitely do it again. That fishery is an arrow straight through my heart and soul now. Great read! Very true indeed what you say about the conditions on the Big C and the skills of John Montana. I haven't traveled far for carping but I must say that the Columbia is my favorite water period. Carp fishing here is by far the best fishing (of any kind) I have ever done. Thanks TF. That boat thing you got going on the Columbia is a pretty sweet idea if I am correct in who this is. Talk about going where nobody has gone before! 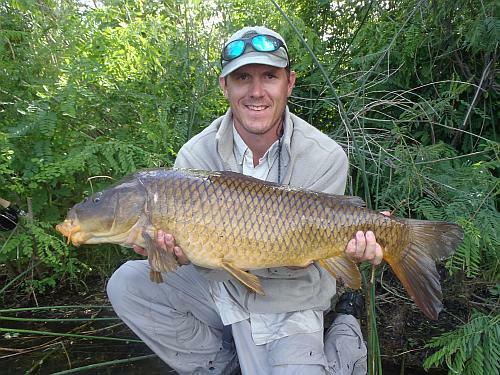 Any carp is a good carp. Even the babies. :) And you rock. The babies are kinda cool looking really. They have a lean-ness to thier head that almost looks mean. 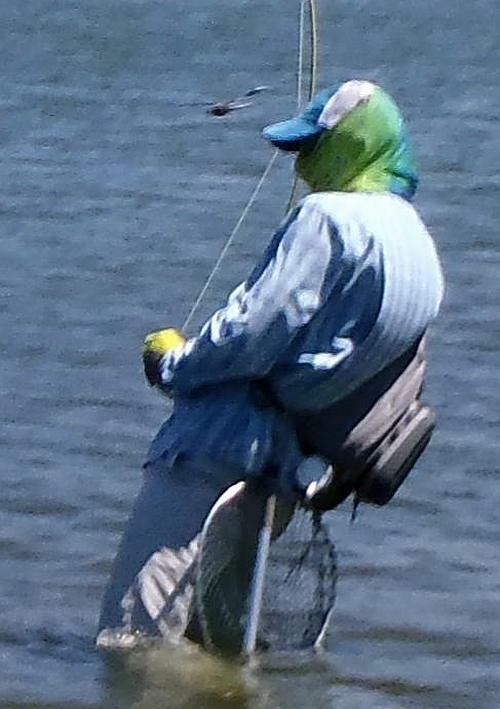 And thanks, means allot coming from the no-holds-barred best fly fishing writer on the internet! Great report Trevor! Away from the river it is easy to forget the devil clouds, the punishing wind, the wildly varying water levels, and the persnickety fish. Oh yeah man. By next year I will have forgotten that part entirely. All I will remember is the cool takes and strong fish. 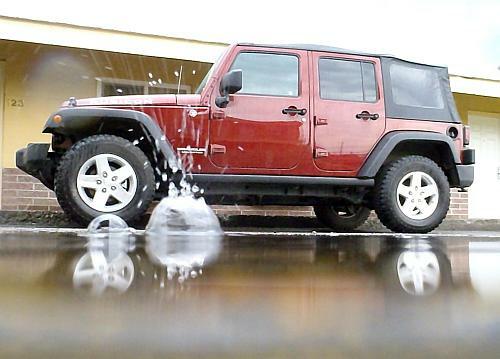 Been reading along with your adventures... looks like good times through tough conditions! Time to get John to Colorado..Carp Slam 2012?? John defenitely has the DSP (Slam or not) on his list of things to do. You know how it is though, lots of dream water out there.